The tribal chic trend is a strong look that evokes a specific natural ambience. 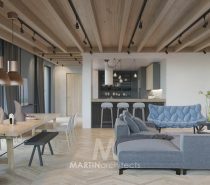 This open plan studio apartment designed by Li Jun Chen & aTng 糖 achieves a sophisticated African look by sticking to a base palette of grey and white. Interesting layers of raw rustic accents are then introduced through textures found in nature, woven into organic handmade accessories and bold tribal pieces. Wickerwork, jute rugs, leather look items, smooth wood tone and large emerald green leafy plants act as the key to executing this exotic luxurious look. See how modern tribal decor is a style that exudes a warmth and embraces a creative mix of cultures. 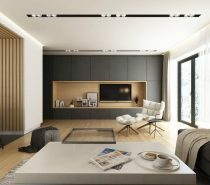 In this elongated open plan, every area of the home is visible from the next. A centrally built sofa forms the living room, which looks over a bedroom by the window and a bathroom on the opposite side. 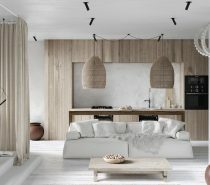 No dividing walls have been implemented so that the natural light from the floor to ceiling window remains unobstructed all the way to the back of the room. Therefore, the style in this space also continues seamlessly. Tribal decor flows over each section in one united scheme. 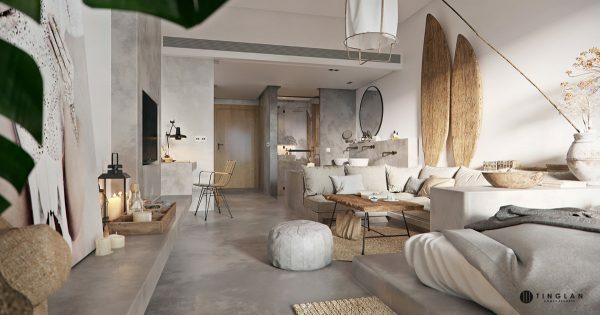 There is no wall art hanging in the rustic living room, but decorative tribal shields are propped against the wall from the back of the concrete sofa structure. The African shield theme continues over in the neighbouring bedroom scheme too – as does the concrete. The base of the bed is a continuation of the volume that forms the couch base and sides. 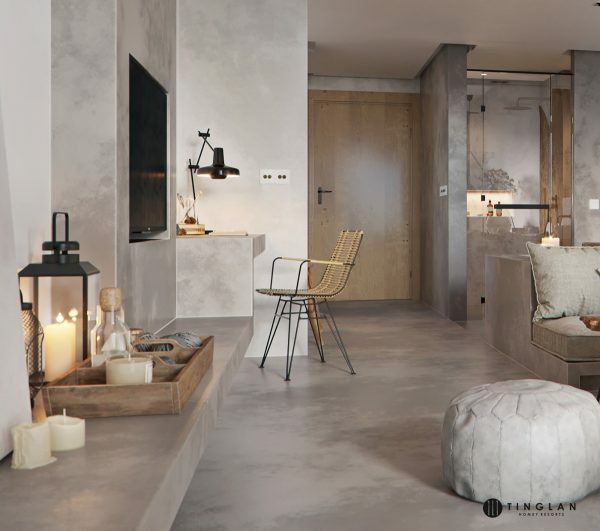 This industrial material keeps the scheme looking sharp and contemporary amidst all of the wicker furniture and accents. The bedside pendant light has a wicker basket style shade and hangs over a white rustic storage chest, which acts as a bedside unit. A few books and candles are arranged simply over its surface. 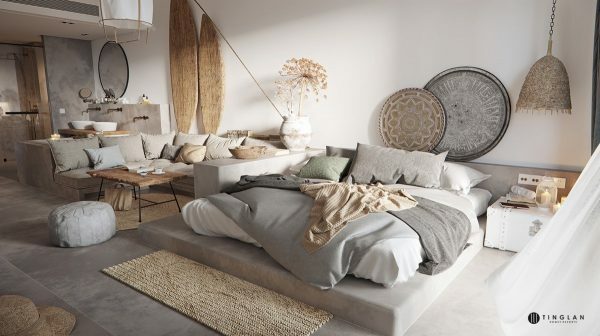 At the foot of the bed a jute rug matches a natural bed throw. 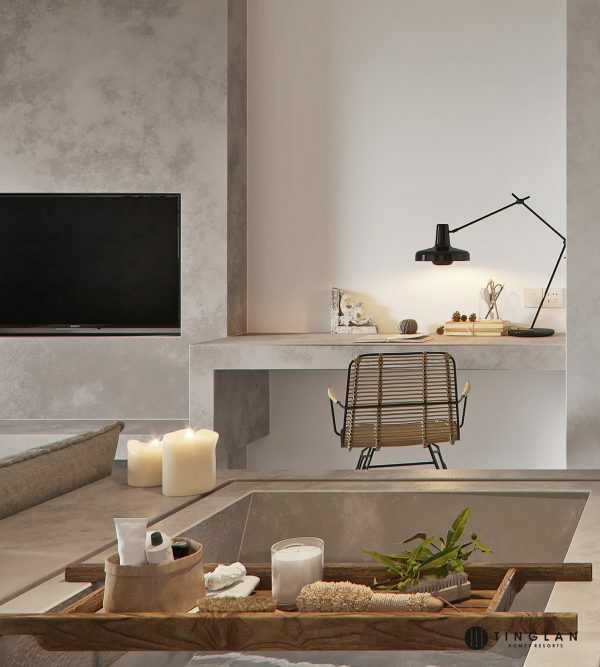 One concrete side of the sofa runs the full length of the bed, providing a low level visual divide and an opportune spot for placing a couple of items, like a wooden bowl and chunky ceramic vase of dried flowers. 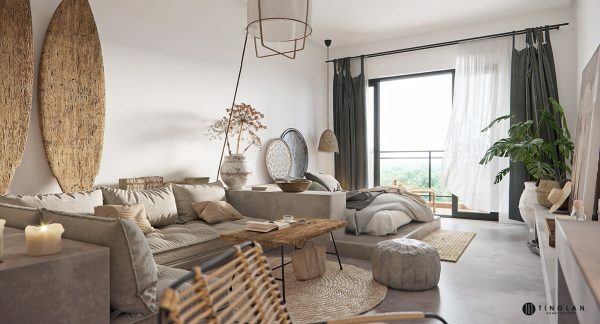 A pale grey Moroccan leather pouffe acts as an extra seat by a wooden coffee table in the lounge area, set atop a round sisal mat. It’s colour matches the grey sofa cushions and throw pillows as well as the bespoke concrete installation. The concrete decor continues right across the floor and climbs up the opposite wall in the form of an entertainment wall. A flat screen television is recessed into the concrete and a console shelf extrudes out of it. The shelf morphs into a higher surface at one end, where it provides a desk surface for working at home. To counteract the cool hard material, a collection of twinkling candles have been set out on a wooden tray and contained inside black lanterns. Ebony black provides a great base note in a modern tribal scheme, it adds weight and depth. There is a black lamp placed on the work surface, and the desk chair has a black metal frame to contrast with its bamboo seat. A large swiss cheese plant fills one corner of the room with vitality and life. It provides the only colour pop inside the entire home. 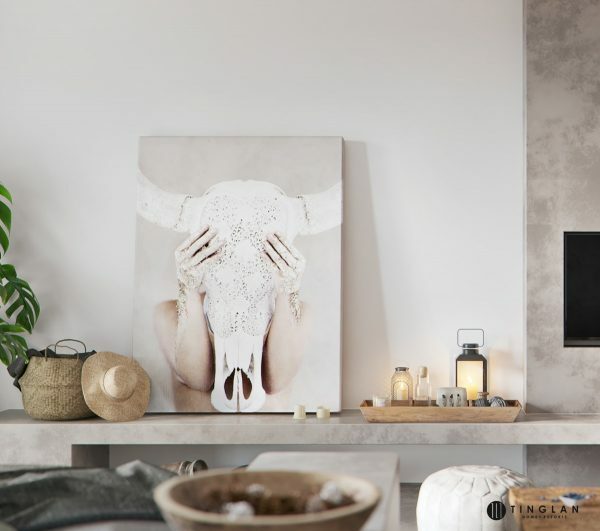 A piece of art portrays a buffalo skull, an ideal subject in tribal decor. 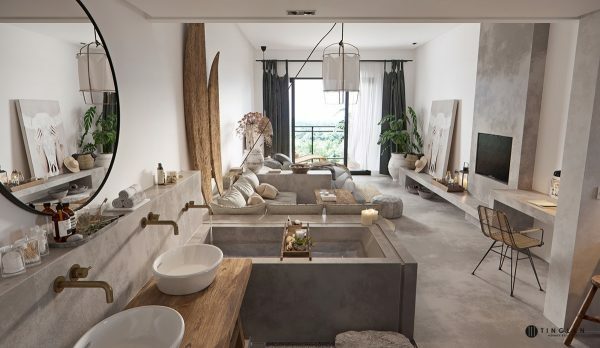 Continuing in the concrete furniture theme, the bathtub is a concrete build and the back of the vanity has its bronze faucets mounted on concrete tiles. A small selection of carefully coordinated toiletries perch on top of the bathroom boxing behind twin white basins. 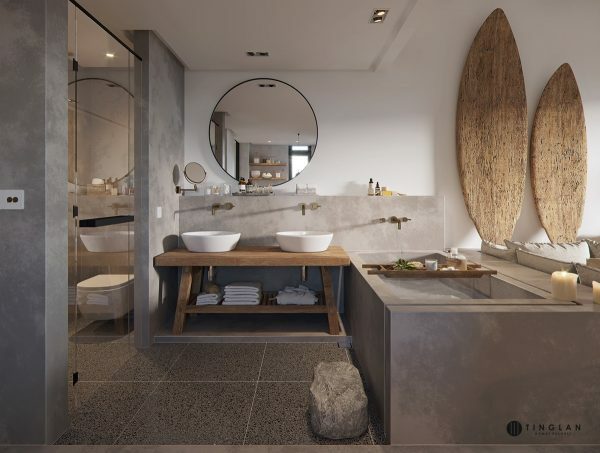 The shower cubicle is part concrete, part glass. A wooden bath shelf bridges the tub, holding more natural toiletries. The flooring across the entire wash area is a grey tile instead of the concrete surface found in the rest of the home. 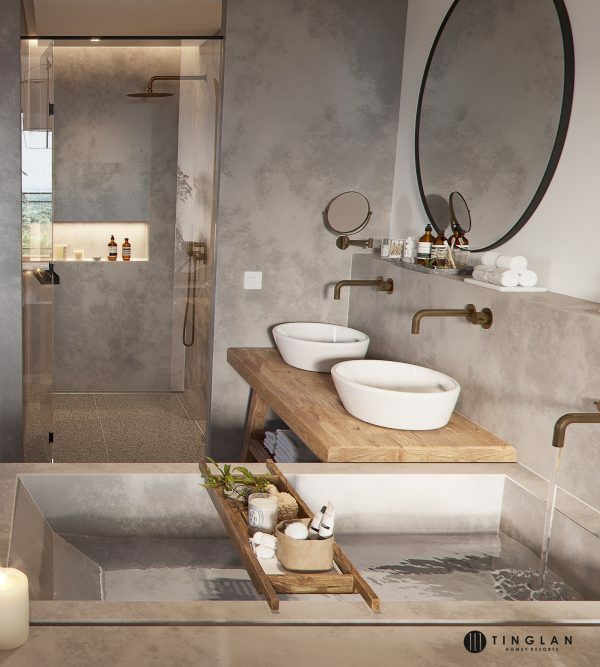 The slope of the bathtub faces away from the desk so that relaxing bubbles can be enjoyed without thinking about workload. A large round mirror with a black frame is centrally placed over the double sink bathroom vanity. An extra shave mirror is wall mounted at one side. 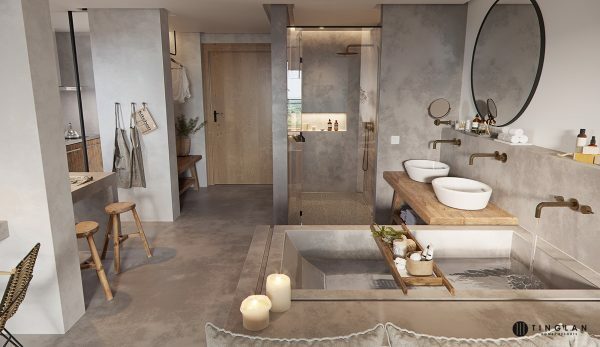 On a shelf beneath the wooden double vanity is a stock of fresh white towels and a fluffy robe, on hand for when one climbs out of the adjacent tub. At this angle we can see that the shower screen also acts as a door to separate off the WC. 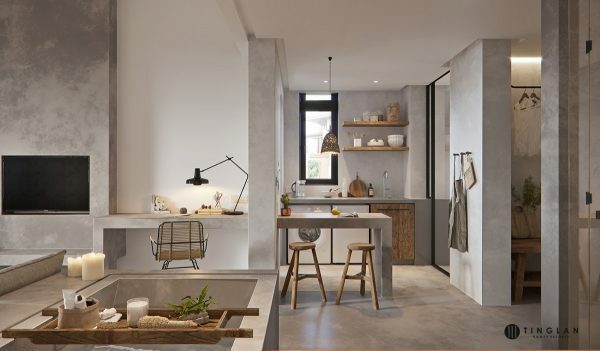 Opposite the open plan bathroom area is the kitchen and utility, complete with a concrete breakfast bar and concrete countertop. Wooden bar stools, shelving and a wooden cabinet door add visual warmth and rustic tribal flavour to the grey kitchen. The two simple bar stools form the only dining area in this compact home. 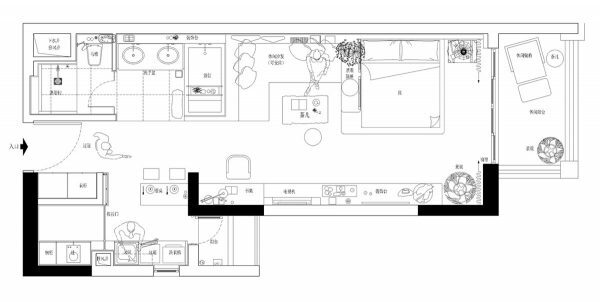 The home plan reveals that a further cooking area is located around a corner, next to the visible utilities, separated off by a glass door. Prep units span each side of the concealed kitchen. To the other side of the open plan utility is a storage area. We can also see that there is a balcony on this home that is equipped with a comfortable outdoor chair and footstool set. Another planter completes the look. What Classifies A House Style: What Makes A Craftsman Home? « The hen is in Adjarian.